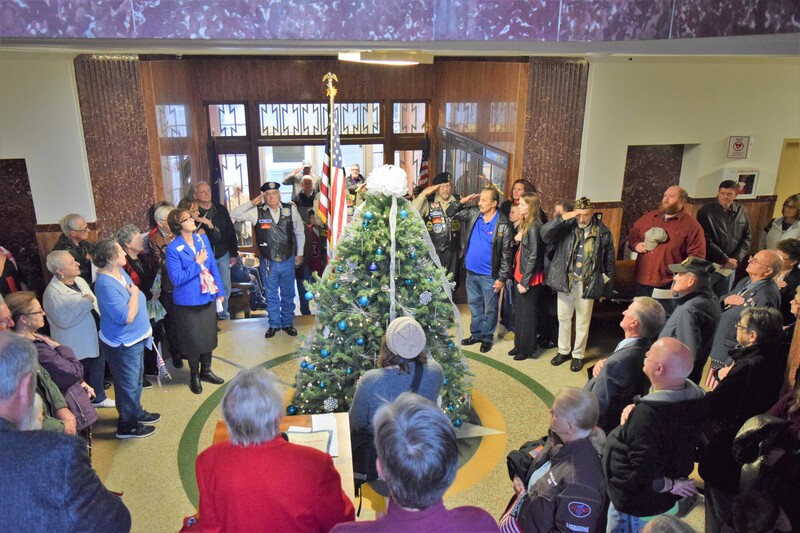 HOUSTON COUNTY – On Sunday, Nov. 11 area residents braved the elements to travel to the Houston County Courthouse in order to celebrate the 100th anniversary of the end of World War I. The event was organized by the Houston County Historical Commission (HCHC), the Major Jarrell Beasley Chapter of the Daughters of the American Revolution, the American Legion Brailsford-English Post #134 and the Veterans of Foreign Wars. Wanda Jordan, Chairperson of the HCHC, opened the ceremony at two o’clock and thanked those in attendance. Because of the inclement weather, Jordan commented there was a total change of plans by moving the ceremony inside of the Houston County Courthouse. “We are here to celebrate the 100th anniversary of the end of the war that was supposed to end all wars. On this particular day, we want to honor those veterans who served in WWI but we also pay a great deal of honor to those veterans who have served since that war, including our active duty service people,” she said. After thanking all those who helped plan and organize the event, Jordan asked Pastor Jimmy Stegall of the Grace Street Church of Christ to bless the event. Following the invocation, Jordan introduced the Color Guard from the Vietnam Veterans Association #991 in Palestine. Richard Dalgren led the detail as the colors were posted for the ceremony. Once the colors had been posted the Pledge of Allegiance was recited and the Star Spangled Banner was belted out by those in attendance. Next on the agenda was Houston County Judge Jim Lovell who read a proclamation declaring Sunday, Nov. 11 as World War I Centennial Day in Houston County. Vietnam veteran and longtime Houston County resident Tom Dillard followed the judge and recalled several Houston County residents who had given their all to defend the American way of life. He also recited a poem called “A Soldier Died Today,” which brought tears to many eyes in the courthouse. 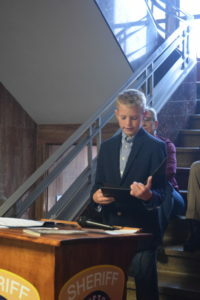 Dillard was followed by his grandson Jacob Plotts, who also recited a poem. The poem he chose was entitled “My Name is Old Glory” and was written by SMSgt. Don S. Miller. “I am the flag of the United States of America. My name is Old Glory. I fly atop the world’s tallest buildings. I stand watch in America’s halls of justice. I fly majestically over great institutes of learning. I stand guard with the greatest military power in the world. Look up! And see me! I stand for peace, honor, truth, and justice. I stand for freedom. I am confident . . . I am arrogant. I am proud. When I am flown with my fellow banners, my head is a little higher, my colors a little truer. I bow to no one. I am recognized all over the world. I am worshipped. I am saluted. I am respected. I am revered. I am loved. And I am feared,” the opening verses of the poem read. Once the poem was completed “Taps” was played and the benediction was given by James Martin to bring the ceremony to a close.